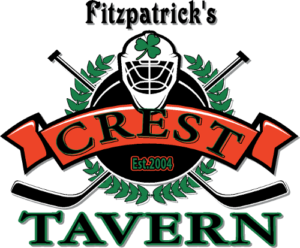 Fitzpatrick’s Crest Tavern is a Local Eatery and Pub focusing on families, but offering options for the more adventurous diners. We feature hand-crafted, freshly made foods, locally crafted ales and cocktails, using locally sourced ingredients when available. Our standard is to sell the highest quality product possible while maintaining value competitive pricing. We define this standard by evaluating all of our ingredients for freshness, nutritive value, and appearance. Tim and Lisa Fitzpatrick welcome you to visit our establishment all year round! You’re guaranteed a friendly atmosphere, great food and drinks, familiar faces, and good times! Open 11AM Daily till close. Be sure to follow us on Facebook and Instagram for special updates.